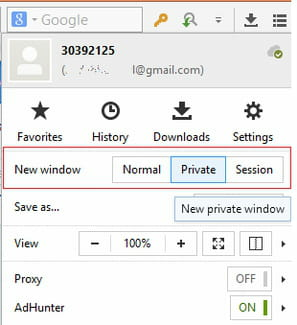 Maxthon Cloud Browser - How to enable the private browsing mode? The private browsing mode of the Maxthon Cloud Browser allows you to browse the web, while protecting your privacy.. Pages viewed in Private mode won't be displayed browsing history. Cookies are automatically removed once the private browsing window is closed. Click on the menu button > New Window > Private. Published by jak58. Latest update on March 31, 2014 at 05:26 AM by deri58. This document, titled "Maxthon Cloud Browser - How to enable the private browsing mode?," is available under the Creative Commons license. Any copy, reuse, or modification of the content should be sufficiently credited to CCM (https://ccm.net/).